HSE First Aid Kit 1 Person. CONTENTS 1 Guidance Leaflet 6 Safety Pins 1 Large HSE 18cm x 18cm ..
HSE First Aid Kit 10 Person. CONTENTS 1 Guidance Leaflet 6 Safety Pins 6 Medium HSE 12cm x 12c..
20 Person HSE First Aid Box. 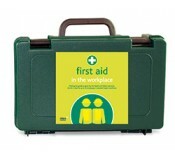 This 20 person first aid box contains 40 x Assorted Washproof Plasters ..
HSE First Aid Kit 50 Person. CONTENTS 1 Guidance Leaflet 12 Safety Pins 12 Medium HSE 12cm x 1..
Assorted Waterproof Plasters (Box of 100 Plasters). A wide range of different sized and shaped ..
Assorted Fabric Plasters (Box of 100 Plasters). A wide range of different sized and shaped plas..
Antiseptic Cleansing Wipes Alcohol Free (Box of 100 Wipes) Individually wrapped skin preparatio..
You must keep a record of injuries that happen to employees. Within the publication is advice o..
A topical, sterile eye wash solution, containing Sodium Chloride BP 0.9% w/v in Purified Water BP..
2 x 500ml Saline Eye Wash Bottles 2 x No.16 Eyepad Dressings 1 x Wall Panel with Mi.. Eye Wash Solution 25 x 20ml Pods. Single use eye-cleaning action. ..
High visibility eye pod station holds eight 20ml sterile saline solution eye pods, two eye pad dress..
Needle Sharp Safe Bin 0.6 Litre. Ideal for community healthcare workers and easily fitted into ..
Needle Sharp Safe Box 3.7 Litre. The sharp safe bOX has a needle remover and is suppl.. Designed to provide employees with information on safety legislation and list sources of further ..